From the simple definition: Compost is a dark, crumbly, and earthy-smelling form of decomposing organic matter.…. to the scientific: Compost is the product resulting from the controlled biological decomposition of organic material that has been sanitized through the generation of heat and stabilized to the point that it is beneficial to plant growth. 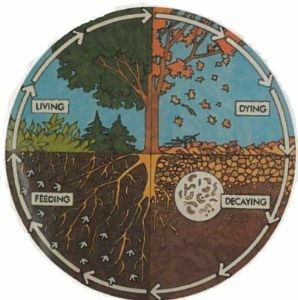 Composting (either naturally or with a little help) is the amazing transformation of organic waste (anything that was once alive) into a soil-like substance with the unique ability to improve the properties of soils physically (structurally), chemically (nutritionally), and biologically. A 2014 study of the nation’s waste generation rates showed that food and yard waste comprise 28.2% of all trash thrown away. Much of this “organic” waste that ends up in landfills can be composted. In Pennsylvania, the PA Department of Environmental Protection estimates that nearly two million tons of yard waste is produced annually. Pennsylvania’s recycling law, Act 101 of 1988, prohibits landfills from accepting truckloads of yard waste, and requires more than 400 communities to collect yard waste for composting. If that yard waste was managed properly, it could become compost, mulch, and a soil amendment capable of increasing our food supply without the need for chemical fertilizers, herbicides and pesticides. Not to mention reducing the need for more landfill space, methane gas collectors, and leachate collection systems at the existing landfills. Composting is an aerobic process whereby microorganisms (microbes, fungus, bacteria, small insects, worms) feed on the dead plant material. Composting organisms need air, moisture, and a food source. The right food source is a mixture of carbon-rich material (brown: dry leaves, paper, twigs) and nitrogen-rich material (green: grass clippings, food scraps, manure). When the right combination of air, moisture and food are met, the organisms thrive, multiply rapidly, and the material decomposes quickly. If any one factor is lacking, the organisms will not do well, and decomposition will slow until the right combination of factors are present. 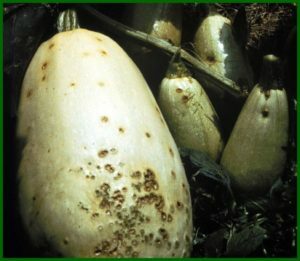 Different groups of organisms feed on the dead plants at different stages. As the microorganisms feed, the raw material breaks down into compost. The activity of the microorganisms generates heat, water vapor, and carbon dioxide. Taking note of the heat generation is a good sign that the compost process is starting. The biological process releases the nutrients that were bound in the raw material, transforming those nutrients into a form that is readily available to plants grown in the finished compost. The finished compost bears no resemblance to the original feedstock. It looks like dirt, and has a rich, earthy smell. Composting happens naturally, but creating the right environment for the composting organisms to thrive will help it occur more quickly. A well-designed compost bin not only makes it easier to create the right environment, it makes managing the compost bin easier and more enjoyable. What Kind of Bin is Right For Me? There are a number of store-bought bins on the market, in all price ranges. However, there is no need to spend a lot of money on a bin, when a very workable bin can be made with material at hand, scrap material, or very little investment. The ideal size of a compost bin is about 4’ x 4’ x 4’. This will ensure an adequate volume of material to maintain heat, yet will not be too unwieldy to aerate with a garden fork. See Westmoreland Cleanways’ Guide To Home Composting for both store-bought bins and home-made bin options. A good compost bin allows for ease of adding and turning the raw material, proper ventilation, holds sufficient volume of material to provide the proper balance of material, and a convenient way to remove the finished compost. Depending on the size of your property and the volume of material you intend to compost, you can have one, two, or more active compost bins at the same time. 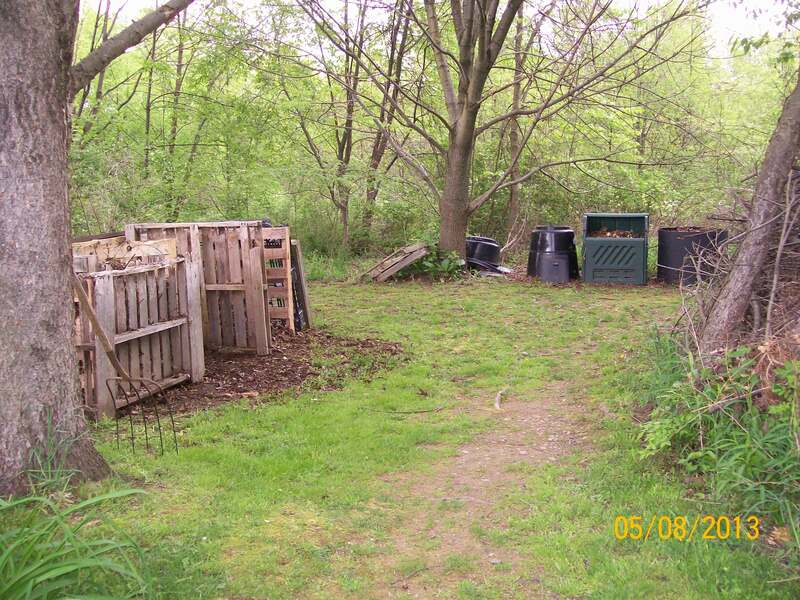 The best site for a compost bin is where you’re going to use it. If it’s too far away from your garden, or too far away from the house to make a quick trip from the kitchen, it won’t get used. The other important consideration is accessibility to water. Compost must be kept moist, and rainfall doesn’t always guarantee an adequate supply. Make sure your garden hose will reach the compost bin. Site the bin where it will be comfortable to use. A sheltered space, out of direct sun and strong wind, will make it more enjoyable to manage in the heat of the summer and keep the heat and moisture within the bin from dissipating too quickly. Note that heat is generated internally by the activity of the microorganisms, not externally by air temperature or the sun. In fact, composting happens throughout the year in all but the very depth of winter. Once you decide what kind of bin you want and where you want to put it, start filling it with feedstock, placing the material directly onto the ground. Most homeowners have a variety of material that can be composted, from leaf waste to kitchen scraps to shrub trimmings. Additionally, different materials are available at different times of the year. It is perfectly acceptable to simply start putting material into the bin as it becomes available. This is a good way to ensure there will be a good mixture of carbon-rich and nitrogen-rich material. If you’ve been stockpiling material for a while, or are starting your bin when you have a good supply of material, it is advisable to have your garden hose ready to thoroughly saturate every few inches of material. This will ensure that there is adequate moisture throughout the pile. Rule of thumb: Any paper contaminated with chemicals, fatty oils or meat, or plants that have gone to seed or spread by underground runner should not be composted. 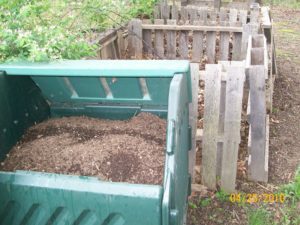 It is helpful to have a variety of particle sizes in a compost pile to keep the material from compacting too much and forcing out the oxygen required by the composting organisms. Leaves, chunks of vegetable scraps, corn cobs, straw, all help maintain adequate aeration. Large items will compost more quickly if broken up, and chopping leaves will prevent them from matting and preventing rainwater from filtering through the pile. There is no need to add any microorganisms to the compost pile. Microorganisms already live on the material in the bin or in the ground; they’re just waiting for the right environment to feed and multiply. 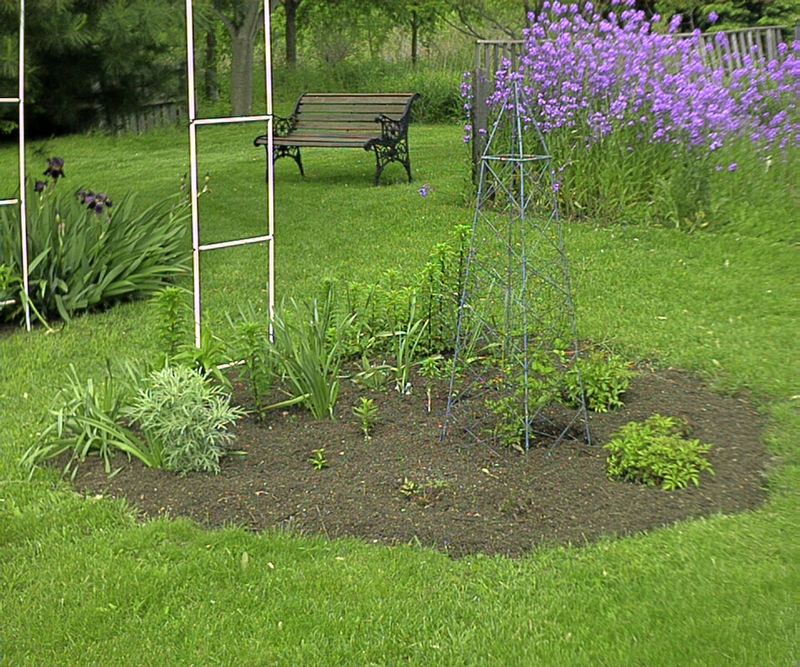 If you want to give the pile a boost, you can sprinkle a shovelful of garden soil throughout the material. 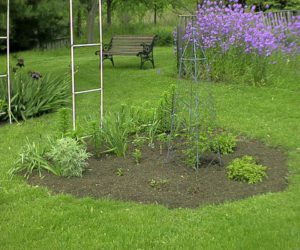 Store-bought compost starter might give your pile a shot of energy, much like chemical nitrogen will green up your grass but quickly fade after the first cutting. So, you picked a bin, set it up, filled it with your feedstock, and watered it well. Now what? Well, now you wait and let nature do its thing. While the outside of the pile will look unchanged, activity tends to take place right in the center of the pile. The microorganisms will begin feeding, multiplying, and generating heat. After a few days, if you hold the tines of a garden fork or a piece of metal pipe in the center of the pile for a few minutes, you will feel the heat transferred to the metal. How much you manage the pile is up to you. 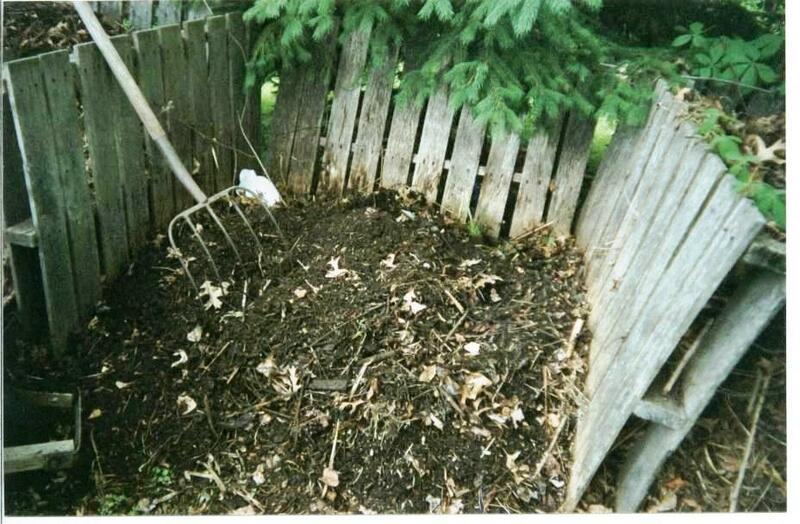 An active composter will want to turn the pile every 10-14 days. A more passive composter will simply let the pile sit. Actively managing the compost pile serves several purposes: a fresh food source will be distributed through the pile to feed the microorganisms, water can be added as necessary to ensure adequate moisture throughout the pile, and the pile can be aerated as it begins to compress. 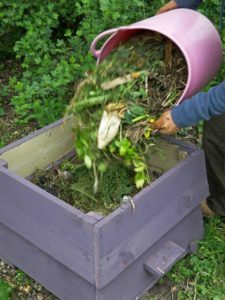 Actively managing the pile gives the composter a feel for what is happening inside; you will begin to see material start to break down as pockets of compost become apparent. You will be able to tell if the pile is too dry, if a mat of leaves is preventing rainwater from infiltrating the pile, or if a clump of grass is starting to smell from too much nitrogen. Fresh material can be added to the pile, turning it in every couple of weeks when you aerate and check for moisture levels. Stop adding new feedstock to the pile when about half of the feedstock is no longer recognizable and there appears to be a lot of humus in the mix. This is what you’ve been waiting for. Now you can give the pile one more turn, aerating and watering as you go. Then just let it sit and continue to compost. At this point, depending on the size of your garden, you can either harvest some finished compost or start a new pile. If you only have room for one bin, you will want to harvest the finished compost and use the unfinished material as a starter for your next pile. Finished compost readily sifts to the bottom of the pile. Some store-bought compost bins have a door that lifts off so the finished compost can be scooped out from the bottom of the bin. Finished compost can either be used immediately or stored until a sufficient quantity is accumulated for your project. Another way to harvest finished compost is to scrape the unfinished material off the top of the pile. 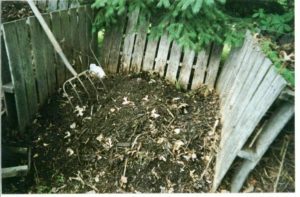 The finished compost can then easily be shoveled away. The unfinished material can be put back into the bin as if you’re starting from scratch. Layer some material, water, add another layer, etc. What Can I Do with Compost? Compost can be used to enrich flower and vegetable gardens, to improve the soil around trees and shrubs, as a soil amendment for houseplants and planter boxes, as a seed-starting mix, or as top-dressing on the lawn. Before it completely decomposes, compost can be used as a mulch or path material. As it continues to decompose, the compost will add nutrients to the surrounding gardens. Municipal yard waste and food waste are best managed at large-scale commercial composting facilities. 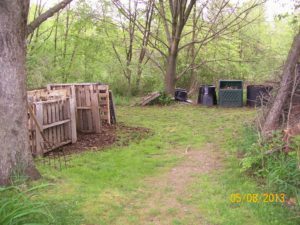 Commercial composting facilities have different rules, regulations, and best management practices than backyard composting sites, and are typically regulated by the state in which they operate. The U. S. Composting Council sets strict standards for commercial composting operations to ensure the safety and quality of the compost produced, which is ultimately sold to the consumer. Large seafood, meat packing, and other food processing operations utilize commercial compost facilities. Food waste that should not be composted in a backyard setting (meat, bones, dairy) can be safely composted at a commercial facility because of the high heat generated and the volume of material being processed. On-farm composting manages the organic waste from farming operations, as well as the manure and bedding material from livestock operations. Livestock carcasses can even be composted using a practice called “morbidity composting”; the carcasses will completely decompose, including hair, hoofs, and bone. From the homeowners composting some leaves and food scraps in their back yards, to the commercial facilities composting 1000s of cubic yards per year, it’s all good. Composting is the best way to keep organic waste out of the landfill and turn it into a valuable resource.